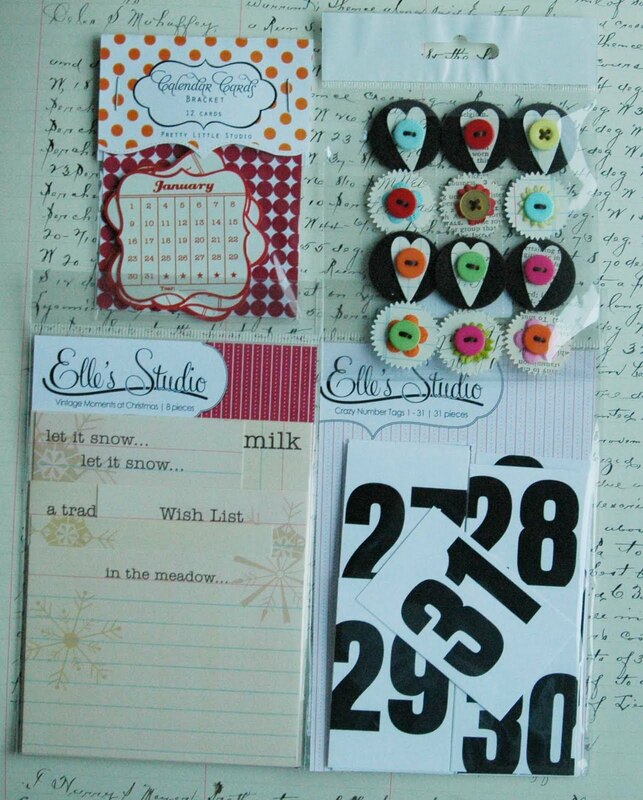 extra goodies: Pretty Little Studio calendar brackets, Elles Studio tags and Evalicious i heart petals stickers. We finally made it out to the Got Craft? 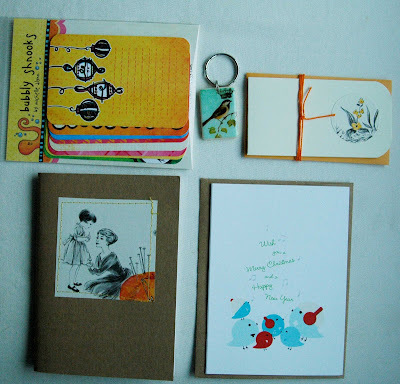 Christmas craft fair in Vancouver on Sunday at 3pm! All because of my indecisiveness:P. So I went shopping:). Got a few things that I'd like to give away (plus a few extras) to show my appreciation of your support this season. TO ENTER: for a chance to win the items above, leave me a quick comment (with this post - sorry, email entries will not be accepted) on whether your Christmas tree is up yet. I'll draw a name on Thursday evening and announce the winner on Friday. Every year, my husband thinks it's ok to put the tree up well into December (2nd week) and it irks me every time cause it doesn't feel like Christmas until it's up. He finally put it up last night but it doesn't have lights on it yet:). Yay it's beginning to look like Christmas around here! I like to get our tree up the weekend following Thanksgiving. But this year my 7 yr old wants to help with the ornaments, so I've been enjoying the tree for now with just lights and garland! Ornaments go on tonight! Lots of them! I feel the same way! It's not Christmas until the tree is up. Unfortunately, we didn't get schedules to coordinate until this past Saturday. So, it is up and it's very pretty. We put of tree up the weekend after Thanksgiving - usally I go black Friday shopping and he puts it up then when I get home I put the lights on it and the kids put the ornaments up. When we finish we have a cup of hot chocolate. Its a wonderful tradition. My tree has been up since the week before Thanksgiving. I traveled out of state for T'giving and I knew I'd be tired when I got home - loving having it up so early this year! Tonight, lights on the house plants. does a rubber tree count? We haven't got a tree this year, we are going to a small danish island to spend christmas, in an cute old house, and then we'll have a big tree. I'd love to say that the tree is up but it's so not -my 2 daughters both have birthdays soon and that has been the focus so far. Yay, our tree is up! I like decorating it as early as we can because if I see a tree in someone's window in the neighbourhood, and ours is not up yet, I always feel like I'm missing out! Happy Holidays! I actually prefer my tree up just before Christmas but with 2 young children.. it's already up! We also have a few Christmas ornaments so they get put out at the same time. We just got our tree on the weekend. We get a fresh one every December from the Scouts. We are doing red and gold this year but our tree is so big we need to buy more ornaments to fill it up. It is summer here in Australia so I don't decorate with snow motiffs. Just baubles and lights and also one-of-a-kind ornaments here and there. well i live at both my moms and dads house, my dad has his up, but my mom, not yet, but i don't really mind right now because i'm focusing on finals that will be here next week, so until those are done, we'll put the second one up! We usually try to get our tree up the weekend after Thanksgiving. i like to enjoy it as long as possible because I'm always sad to take it down. I have mine up...your right it doesn't feel like Christmas until the lights are on and twinkling!! Yep! Our tree is up!!! This is our first year (in our 4 years of marriage) we have put up a tree! I love it and I am having a blast decorating the house!!! Thanks for the giveaway! Keeping my fingers crossed for a win!! These goodies will go great with my Christmas kit I purchased from you last month!!! Yep - all of the trees (our family tree and one in each of our daughter's rooms) were up the day after Thanksgiving. It seems as if that is the best "family" time we have since December ends up packed full! I usually get the tree up the weekend after Thanksgiving. But this year, we have been doing some redecorating in the family room, and I just managed to get the tree up two days ago. Tonight, we put the ornaments on! our tree is up, but not decorated. i usually like to get it done the first weekend in december, but we just got home from a trip for my SIL's wedding so, yeah. no completed tree just yet. Thanks for a chance to win. :o) Yes, my tree is up - finally got it finished last weekend - now my cat is tearing it apart one ornament at a time. As much as I would love to, there is no tree for us. We have cats who think it's funny to knock it down and a dog who thinks it's ok to pee on it. you're right about the feeling when the tree is up. ours is up and it stayed undecorated for almost a week, but it's all done and now it's Christmastime! I usually like to put our tree up the day after Thanksgiving, but this year we were out of town and it went up a little later. I'm like you, doesn't feel like Christmas until the tree is up! I love just sitting with it all lit up!! 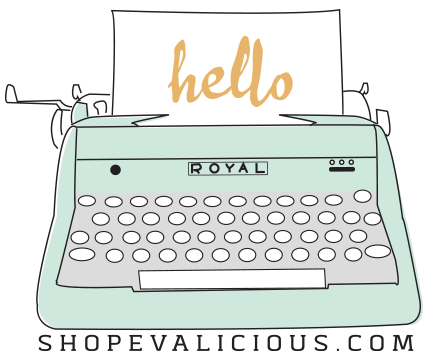 I'm usually a silent stalker of your blog, but couldn't resist your giveaway. I feel the same way about the Christmas tree. My husband and I usually take our son to go cut one down every year, but this year we're just gonna buy one off a lot. He's out getting it now. Can't wait. We put up our tree 2 nights ago and decorated it last night! I agree that it doesn't feel like Christmas until its up but we usually don't have it up for another week (real trees just don't last that long!). Thanks for the chance to win! My tree has been up since before Thanksgiving! I've never done that before, but this year is my first as a divorced mom and I wanted as much Christmas joy with my three-yr-old for as long as we could get it. It's been very peaceful sitting in the living room with just the tree lights on every night. I put mine up the day after Thanksgiving last year and it was wonderful. I haven't bought it yet this year and I am irked also :) Love the give away! haha, you are closer than me. I have the box out, but the tree is still in it! Great Giveaway! Yup, got ours up the weekend after thanksgiving so that we can enjoy Christmas a little longer! Christmas trees absolutely make it feel like Christmas instantly! No tree this year, but perhaps in future years. We typically go to my in-laws for Christmas, so we just enjoy their tree. Heh. No tree yet. We are on for the weekend though. We are waiting for no rain to cut a tree down. awesome give away! We have our tree up. We put it up the monday after thanksgiving. I agree... it doesnt feel like Christmas till the tree is up and ready! No, the tree is not up yet. We always get a real tree. We'll probably go out this weekend and pick one out. Now that I have my own family we all (we have 2 children 7 and 10) go the first week of December. We are not picky: full and about 7 ft tall is all it takes. The fun part is the decorating. Every year every family member get's a new ornament and the kids love to get out theirs and put them on the tree. I still like at home. Mum NEVER puts the tree up until at least second week of December. But this year without prompt she put it up on the 1st! I'm not sure what has gotten into her - perhaps its because us kids haven't been pestering her about it. Hopefully it will stay up longer after Christmas too! my family never put up a tree so I don't really get the tree actually (teehee) but thank you so much for the giveaway! I wish I was one of those that gets their tree up TG weekend, but we still don't have a tree. We have to go out of town for a funeral this weekend, so I'm not sure when we'll even get a tree. In Hungary the christmas tree is up just on the 24th of December!! We never making the tree befor this day!! But I totally love the tree so can't wait to have one too! We usually put the tree up the day after Thanksgiving BUT this year we didn't get our household goods until the day after Thanksgiving so we put it up this last weekend. We just put ours up last week. This year we caved and got a fake one already with lights. We are considering getting an air freshener for cars and hide it inside the tree for some pine scent. What do you think? We put our tree up Sunday last week. We were going to leave it until the second weekend in December, but I wouldn't stop twittering on about it, so it's up in all it's Christmassy glory now! We put our Tree up a few days after Thanksgiving. We actually got a new artifical tree this year and it was so worth it. But although its up; we still haven't added the ornaments to it yet. I am hoping to get some new ones painted with the kids so that we can put all of them on the tree this week. Our tree went up on 1st December. We had so much snow the schools werent open where we live so it gave my daughter something to do. I agree that it doesnt feel like christmas until the tree is up, also for us I dont feel christmassy until I have taken my children to see father christmas at Harrods - we go every year and it is so lovely. No tree for us yet. We usually put it up a little closer to the middle of the month. It'll be late this year because my husband will be working out of town this weekend and our holiday decorating plans will have to wait for him to get home. Looking forward to spending time with him decorating and reliving the holiday memories and making new ones! No, tree isn't up yet. This Saturday for sure! I put up our tree with the children the last weekend of November. We usually put ours up the 1st weekend in December. It's apart of our daily advent tradition. I agree doesn't feel like Christmas without a tree. my tree will be up tomorow with the help of my 4 year old son. It's a first for him. I usually decorated it in the evening and he was surprised in the morning. J'ai hâte...I'm eager to do this with him. Thank you for the giveaway Eve. I put a mini tree in my kids rooms and a big on in the library. Awesome givaway!! I agree the decorations must be up to get the season going. Hope you get light on today. Thanks for sharing. I'm loving my art journal are you going to post any pictures of your journal or do you even have time to do that. Glorious giveaway! Afraid no tree yet. We are doing a very unstressful holiday season this year as we are a bit overwhelmed with the loss of loved ones and health issues. Thank you for the chance to win. I putting it up today! i agree! i always put up our tree Thanksgiving weekend but by the time Christmas comes i'm tired of seeing it LOL thanks so much for the givaway! My tree is up and decorated. Just waiting for Santa to put some gifts under it. Embarrassed to say no--I blame it on a grandchild getting sick over the wkend. We were going to do it together. How's that for an excuse? I totally agree. . .I was making a ton of cookies last week for a Sat cookie walk and it still doesn't feel like Christmas with decorations not out. ours went up this past weekend! my birthday is the first of december, so i like to wait until after that so occasions don't get mashed together. i like the tree to come down right after new year's though! all.done. by then. Not yet :( I hope it will be up by the end of the week! We usually get a tree later in December because otherwise the needles fall off way too early - even if we keep it watered the weather is so dry. This year we won't be having a tree because we're heading to my parent's place on the 22nd. No Christmas tree this year...we'll be out of town for 3 weeks! Otherwise, yes it would be up! We actually got our tree up on the first and decorated on the third. Love using your Christmas Art Journal to record it all! Yes! It's up, and you are right. It now feels like Christmas! We went and picked out our tree today and put it up and decorated it tonight. Bring on the Christmas! Yes, the Christmas is up :)! One thing that doesn't need to be done. I start getting hives if it's not up within a week after Thanksgiving. I don't want to go through all of that effort for a couple of week's enjoyment! Our tree is up! Has been since the weekend BEFORE Thanksgiving in the US, my husband works retail and this is his INSANE season and it's easier to enjoy putting it up early so we can do it as a family. Nope no tree here yet!!! Hopefully this weekend if the weather cooperates. I put my tree up this weekend! I mailed my Christmas cards and I'm ready for Santa to come visit me! my tree went up at the weekend as im working pretty much constantly until christmas eve!! My tree is totally not up yet. Trying to decide whether to put it up or not. 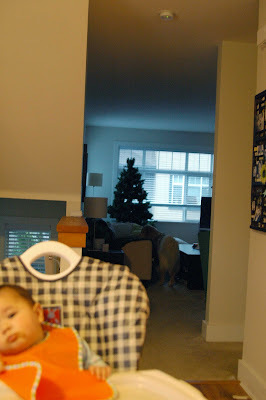 We put up our tree Dec. 5th The night St. Nick comes to put some goodies into your boots...confused??? This is a Croatian tradition...actually the traditional way to do it is to put up your tree on Christmas Eve!!!! Love all your giveaway goodies!!! Our tree is not up yet, it will be put up this weekend. The rest of the house is decorated though. our tree is up! actually got put up 2 weeks before Thanksgiving because we have our first christmas the day after thanksgiving. Haven't bought our Christmas tree yet!! Be glad you're not married to my husband...we can't put it up until AFTER the 4th Sunday of Advent, but it's up thoughout the liturgical Christmas season and comes down after the Epihany. Merry Christmas! We had our tree up the day after Thanksgiving and the my girls helped me decorate it with the ornaments. He knows the routine that it must be up after Thanksgiving and I agree to make sure it's down on New Years Day. Ohk, my tree isn't up yet, but I still have time. It is inside teh house instead of stored in the shed. Thanks for a chance at some goodies. terriavidreader at yahoo dot com. The tree is 1/4 way up! *haha* Lights and baubles to follow. The mini trees in my girls' rooms (their heights) are up but we are going to add hand-crafted ornaments this weekend! In Ireland we traditionally put the tree up the 8th December, but this year we were snowed in (never usually get so much snow so early in the year) so we put up our 2 trees last week. So glad as its true its not really Christmassy until the house is decorated. My christmas tree is not up yet, we never get it done till school's out. my husband would wait until next weekend (the 3rd advent) but for me Dec 1st is the deadline lol this year I went Christmas tree shopping alone with the kids, I amanges to put a 7 feet tall tree in the car and bring it home and when he arrived from work he was very suprised, and the kids so so happy. My husband is the opposite he wanted it up before Thanksgiving but I got him to wait until Thanksgiving. My kids got to decorate it this year. I'm from Germany and they put the tree up as late as Christmas week. However, I like the tree to be up and decorated the week after Thanksgiving. I Like To Get Our Family Christmas Tree's Up By The First Sunday In December (Sunday Is Our Only Official 'Day's Off') But It Seems Like Every Year It Comes By SO Fast That It Doesn't Actually Happen Until The 2nd Sunday.. Same With The Outdoor Christmas Lights. As Far As Ornaments.. That's Another Story *lol* I Try To Be As Stress Free As Possible During The Holiday Season.. As Long As The Memorable Ornaments Get On At Least One Of The Trees & The Family Puts Them Up Together.. I'm Happy :) We May Skip The 'Fancy' Tree Ornaments This Year.